« Henry Norris at the Arsenal part 4: the proposed mergers with Tottenham and Chelsea. By March 1910 it was being widely reported in local newspapers, the national press and the specialist press (particularly Athletic News) that Woolwich Arsenal FC was in significant financial trouble. This difficulty had come about through additional crowd income that was generated by the evolution of the club into a first division side in 1904 and a club that reached the FA Cup semi-finals in 1906 and 1907, not being maintained thereafter as the club’s fortunes declined. It looks as if the crowd seriously expected Woolwich Arsenal to rise up to a position of dominance following its promotion and two cup semi-finals. When this did not happen, the crowds fell away. In the last article we looked at the shareholders meeting of 18 March 1910 and the appearance of William Hall before the meeting. We may presume he was there to express the interest and intentions of Henry Norris and himself. However it should not be thought that the work of the club had dried up while all the negotiations continued about the club’s future. Evidence to the effect that Arsenal continued to prepare for the future comes from the fact that on 4 March 1910 George Grant joined Woolwich Arsenal from Invicta FC as an amateur. He later turned professional at the club and had the remarkable record of playing for Woolwich Arsenal, The Arsenal, and Arsenal. And indeed there were even moments to celebrate as on 5 March 1910 when Archie Devine won his one and only cap playing for England. But results on the pitch were not helpful. 12 March 1910 saw the goalless draw at Plumstead between Arsenal and Manchester United, a result that left Arsenal and Tottenham equal on points near the foot of the table, with Arsenal in the relegation zone on goal average. Worse for Arsenal, Tottenham had two games in hand. In terms of the survival of the club however we left matters in the last episode on 18 March with a shareholders’ meeting for 18 March 1910 to discuss the possibility of liquidating Woolwich Arsenal FC and forming a new limited company. No modern company would allow this, because it would mean, (and indeed it did mean for Woolwich Arsenal) that the board of directors could change year on year and decisions made by the board one year could be changed by the new board a year later. Different factions could win and lose control and thus there would be no continuity of approach for the club. One group might want to borrow money to speculate on new players, the next might urge caution, and so on. Leavey’s plan, according to Davis, was to allow only shareholders with over 25 shares be eligible to be a director. But the problem is that to be passed, such a proposition would have to be agreed by the current board, which of course had benefited from being elected under the old system. But if this was Leavey’s plan, then seemingly he did not mention it at the meeting. Instead he made his pitch by noting that the club had liabilities of £12,500 (about £1.4m in today’s money) and was still losing money. His proposal was that they should agree to attempt to keep a club in the area, agree that the club could not continue in its current financial state, and that it should be wound up voluntarily, and must appoint a liquidator. This looks very much like a proposition to see off Hall and Norris: a plan to wind up the company on the grounds of its debts and then set up a new company with the 25 shares provision for anyone wanting to be on the board. Hall and Norris’ plan was only just emerging and we don’t know how much they had shared their thoughts with Leavey, but at some time talk evolved of Arsenal moving onto a ground share arrangement with Fulham at Craven Cottage (a ground that had been upgraded – using Archie Leitch as architect – in 1905 under the guidance of Henry Norris). So Leavey turned down or simply ignored the Fulham plan and seemingly did not tell his fellow directors about it. Instead his accountant was appointed liquidator. On Saturday 19 March Arsenal were away to Bradford City, and won 1-0 with 14,000 in the crowd. Ultimately it was to emerge that Arsenal’s average crowd for the season was 10,395, a decline of 20% over the previous season, so at least this was a touch of good news – an above average crowd, and a win that helped stave off the threat of relegation. The trouble with this approach was that (as is still the case in the 21st century) most people – indeed most business people – did not understand the way voluntary liquidation worked, and thus an offer of half the amount due would seem more like a con trick than a generous offer in the face of an alternative of quite possibly getting nothing. But despite some difficulties an offer to buy the club was made and under the rules of liquidation the liquidator had to accept what in his/her professional opinion was the best offer on the table. In this case that was easy. Hall and Norris had made no formal approach and thus the Leavey New Deal was the only offer there was. The liquidator accepted it. The following day, 20 March 1910 Dr John Clarke, the head of the Arsenal fund raising committee began a tour of the public houses of Plumstead offering shares in the new club at £1 each. This was a job that needed doing quickly as the rules of offering shares in a company put a strict time limit on how long the shares are on offer for. If not enough shares are sold by the end of a very short offer period then the offer falls. It appears that the attempt to sell shares locally did not go well, and on 23 March 1910, with Arsenal now very publicly revealed to be in serious financial trouble, Tottenham Hotspur considered buying part or all of Woolwich Arsenal. We have no knowledge of what Tottenham’s plan was, but as with Fulham it could have been for a ground share, with both clubs playing on alternative weekends at White Hart Lane. If it was that, that was quite ironic considering the fuss Tottenham made when Arsenal moved to Highbury in 1913. Rangers (of Glasgow) also considered the offer and ultimately did make a small but symbolic investment of shares in the club which remained until the 21st century when they were sold to help resolve Rangers own difficult financial position. Rangers’ interest has always been seen as one of solidarity but it is interesting to note that on 28 April 1908 Rangers played Woolwich Arsenal for the first time: the result was a 1-1 draw. It was part of (or perhaps the highlight of) a major Scottish tour by Arsenal of eight matches in nine days and it is certainly possible that the contacts established then were maintained. On 25 March 1910 (Good Friday) Arsenal had another away game – this time against Newcastle and got a draw in front of 20,000 – another good above-average crowd, which again helped both the club’s position in the league and the club’s coffers. After the result of the game at Newcastle came through to the Plumstead pubs by telegraph, Arsenal held a public meeting followed by a shareholders meeting in Plumstead regarding the financial crisis, and then various fundraising systems were set in place. But any buoyancy that might have been felt was quickly dissipated. On the following day, 26 March, Arsenal were at home to Sheffield Wednesday, and lost 1-0 in front of just 8,000. If ever there was a moment that represented the nail in the coffin of Arsenal it was this crowd. 8,000 on Easter Saturday was not good news. The only excuse might have been that the supporters were saving themselves for Easter Monday, 28 March, – the game that the much of London had been looking forward to – the biggest match in the capital of the season. Chelsea at home to Arsenal. 40,000 turned up as Arsenal won 1-0. Better again, at least in terms of result, Arsenal won their next match – away to Bristol City on 2 April, The crowd was again only 8,000 but Arsenal’s position in the league was looking more secure by the day. Meanwhile the group looking to buy out Woolwich Arsenal FC Ltd had been active finding subscribers to its proposed share bid. They met on Wednesday 6 April and by 9 April, while Arsenal were playing out a goalless draw with Bury in front of 10,000 spectators, they felt secure enough with their pledges of finance to make a bid for the club which the liquidator and George Levey (who had a say in such matters as he was lead creditor) accepted. Not that the smaller creditors thought it was a good offer, but rather that it was probably the best offer anyone would be likely to see. And this is where I have to be a little tedious and venture into the world of liquidations. The best voluntary liquidations are planned carefully by the directors of the company and their accountants, and have the whole process of the liquidation thought through and worked out well in advance: in short an orderly winding up of the company, with the arrangements in place for paying all debtors in full over a period of time, and quite often the setting up a new company (although today there are of course strict rules about this, to avoid liquidation being used simply to avoid past debts). Whether Leavey had such a clear plan in mind or not we can’t say. If he did he was being Machiavellian in his planning; if not he was simply being emotional. Either way after Arsenal had played out their (previously abandoned match of 6 September) against Aston Villa on 12 April Leavey met with the group Dr Clarke, of the fundraising committee, had put together to buy out the company from the liquidators. But this is where the story takes another twist because it seems that at this point (and only at this point) Leavey informed the new group that the deal would involve the new directors of Woolwich Arsenal FC Ltd being personally liable for paying rent, rates and taxes on the Manor Ground. The fact that this was not mentioned before suggests either that Leavey had forgotten about it, or did not know about it, or was deliberately leaving the issue until the last minute, knowing that it was a potential deal breaker. Reading the history of Leavey, I suspect he had quite simply forgotten about the clause; he does not at any time come across as a Machiavellian character, but rather as someone who had started out helping Arsenal, but had then found himself in far deeper than he had ever expected. Thus I see him as someone who enjoyed the publicity of being a patron of Woolwich Arsenal FC but then was unable to say “no” as greater and greater requests for finance came his way. But that is supposition. From Sally Davis’ account it appears Leavey now worked to convince the would-be directors of the new club that they also had to sign this arrangement in order to let Leavey out of his current obligations, which presumably existed outside of the lease as a separate legal document. This again shows us why Leavey desperately needed a new company to take over Woolwich Arsenal FC. If the club simply failed and ceased trading (without the setting up of a new company to take it over) he would still be liable for paying the rent on the ground, and for returning it to the landlord in the condition it was when the club took it over. For a man already in financial difficulty because of his loans to Arsenal, that could be disasterous. Then something quite strange happened for (again according to Davis) on Friday 15 April, Leavey went to see Archibald Leitch. Now Leitch was the man who oversaw the development of the Manor Ground around the turn of the century (seven years after Arsenal first moved in), and it, from the details still available, it appears he had never been paid for that work. Leitch had become famous for having worked on Ibrox Stadium in 1899 for Rangers just outside the Glasgow city limits (and thus outside their planning control). Three years later part of the stadium collapsed causing many deaths. In the subsequent enquiry Leitch was not charged with any crime (partly because the stadium was carefully placed outside the city and therefore not subject to city regulations) but there was considerable doubt expressed over whether the builders used the right materials. Leitch had specified a high grade of wood, and was in charge of overseeing that this stipulation was complied with, but the evidence presented in the hearings shows that other than writing a letter or two expressing concern, he was not fully engaged on the issue. It was beyond doubt that his instructions were not obeyed because of the lowering of the specifications that part of the terracing collapsed. Now why Leitch did not get paid by Arsenal, and why he was not suing Arsenal for payment by 1910 (ten years after the work was done) is not at all clear. After the Ibrox disaster Arsenal could have had good reason not to pay him on the grounds of previous incompetence, but as to how Arsenal managed to avoid paying him up to that point, I really don’t know. One can only assume a long running dispute about technical matters within the design that Leitch had proposed and then implemented. But the records show that here they were, ten years down the line, with Leitch unpaid. And Leitch and Leavey agreed a deal with Arsenal to resolve the issue. What that deal was we don’t know but it seems quite possible that the agreement was that if Leavey was able to sell the club then Leavey would pay Leitch a percentage of the debt – or that Leitch would put in a lower bill in to the new owners of the club. Clearly Henry Norris knew Leitch in relation to the 1905 building, and indeed Norris appeared in court on Fulham’s behalf when the local council challenged the work on a technical point (Norris won). Thus the arrangements that led to the debt being unpaid in 1910 remain unclear but Leitch certainly did work for Arsenal again – at Highbury. Meanwhile the arguments in Woolwich continued, and ultimately a new rescue package was agreed with a new set of would-be directors but still with Leavey as the chairman, which given the fact that Leavey wanted above all to get out of his liability to Arsenal seems odd. But it is clear that his obligation to pay the rent on the ground if Arsenal defaulted, remained in tact at this point. Perhaps Leavey was influenced by Arsenal’s upturn in results on the pitch. Between 28 March and 16 April Arsenal played five, won three and drew two. Best of all, the run that had started in front of a 40,000 crowd at Chelsea, ended with a game in front of 39,000 at Tottenham. Perhaps he had no other way to get any of his major loans to the club back – even if it was only in part payment. Maybe he had another exit plan – but I still find it most likely that he was letting his emotional engagement with the locality cloud his judgement. After all, if Arsenal closed, his shops would still be in Plumstead and more likely than not he would be blamed for Arsenal’s collapse, no matter how unfair such blame might be. But it is worth noting, that it was also at this time that the first stories concerning a link between Arsenal and Fulham started to be heard. In one way this is not surprising given that Henry Norris had been at the opening public meeting and William Hall had turned up at the shareholders meeting for a word with with Leavey. However what was new around this time was the fact that there was a notion of saving money for Arsenal by ground sharing. You will recall we have already had some talk of moving away from Woolwich, and the fact that Millwall were ready that summer to move across the river, a distance of about eight miles for supporters who lived near the old stadium. Manchester United had also recently moved from Bank Street to Old Trafford earlier in 1910, a distance of about six miles, and thus such moves were becoming familiar to supporters of the game at large as support grew and clubs found the need for something better. On 8 April Arsenal revealed the club’s debts to be £6200 (about £750,000,000 today) including £1630 to Mr Leavey, and £1347 to Archie Leitch. On 9 April Arsenal drew 0-0 at home with Bury while on 11 April 1910 Arsenal beat champions Aston Villa 1-0, and thus gained valuable points in their battle with relegation. However Villa, having already won the league, put out a reserve side for this match. Chelsea and Middlesbrough protested vigorously to the League, but to no avail. And all the time William Allen, William Hall and Henry Norris (all three directors of Fulham) were preparing to act. In fact William Allen soon removed himself from the arrangements, but Hall and Norris were there for the long haul and there was growing talk about sharing arrangement at Craven Cottage. William Hall and Henry Norris played the sentiment card much of the time talking about the need to preserve the capital’s oldest Football League member, but underneath it all was a financial arrangement. Hall and Norris had no influence over Arsenal of course, they were simply offering a way out of Arsenal’s problems that could benefit Fulham by giving them an extra income as ground owner. It must also be remembered that Woolwich Arsenal had a name – a name associated with the military, with the term “Royal Arsenal” and with being the first professional club and the first league club in London. This was the club of the fighting man, set up by working class men, not aristocrats or religious leaders or business owners (as was the case with many other clubs). Most certainly Fulham FC was not trying to buy Woolwich Arsenal FC, as Fulham was only now just paying off its debts and was currently running at a loss. Rather, the thought was that Fulham could benefit from a rent paid by Arsenal. Also it subsequently appeared that there was a thought in Norris’ mind that Arsenal and Fulham could merge and take over Arsenal’s much cherished first division status to become the pre-eminent London club, playing at Craven Cottage. George Leavey however resisted all talk of playing in Fulham or of amalgamation, and pushed ahead with his own plan. The Kentish Independent on 22 April published a letter from Leavey announcing that shares in the limited company set up on 15 April would be on sale from 23 to 30 April at £1 each. But the printing of the share prospectus was delayed, and in fact the shares finally went on sale between 6 May and 10 May. Shares were £1, payable in instalments, and £2000-worth had to be sold for this latest rescue bid to go ahead. But by the close of sale, only £1200 had been applied for, and so under the rules of new share offers enshrined in statute, the offer failed. And so, as a result of this failure, on 25 April 1910 the limited company that was set up to run Woolwich Arsenal in 1893, The Woolwich Arsenal Football And Athletic Company Limited was dissolved. A new company was set up on the following day. bearing the same name as the old one. This company still trades today and continues to carry out its business as Arsenal FC. This did not get Leavey out of his commitment to pay the rent and dilapidation charges on the ground if it was handed back to the landlord, and nor did it get any of the money he had loaned Arsenal back. It gave Arsenal a reprieve in walking away from some of their past debts, which would not have pleased local creditors, but Leavey personally was still stuck as the guarantor of Arsenal. If he stopped being the guarantor, Arsenal would no longer be able to get credit – and with there being no income in the summer, Arsenal would collapse. On Wednesday 11 May 1910 an interview with Leavey appeared in a London newspaper in which he said that he was now facing personal ruin and that he couldn’t continue to run the club. 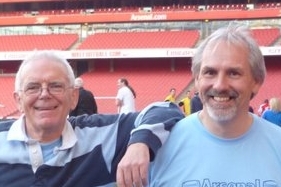 He once more asked for another group of people to come forward – from anywhere, not just Woolwich – to try to form a new limited company to take over Woolwich Arsenal FC. And thus suddenly, it seemed, he was willing to talk seriously with Henry Norris and the people at Fulham. He would have to do this quickly, as he would also certainly have to talk to the Football League who would want to know that Woolwich Arsenal FC would be able to meet their fixtures for the 1910/11 season. The series continues with Part 4: the proposed mergers with Tottenham and Chelsea.